Originally published on The Grid on September 12, 2012. This was my first piece under the “Ghost City” banner, which the publication had used periodically for similar pieces. “Ghost City” lasted as a weekly column through June 2013, though the title was occasionally brought out of mothballs by other writers. When the Gold Diamond restaurant opened this summer, it inherited a building teeming with ghosts: Paranormal spirits are reputed to have inspired the lion statues out front and once required the services of an exorcist. Symbolic ghosts have also left their mark through the legacies of a Jewish-community landmark and a series of Chinese eateries. Dress-making strike, crowd at Labor Lyceum, 346 Spadina Avenue, February 25, 1931. City of Toronto Archives, Globe and Mail fonds, Fonds 1266, Item 23262. Originally occupied by residences, the southwest corner of Spadina Avenue and St. Andrews Street was purchased by the Toronto Labor Lyceum during the 1920s. Founded in 1913, the organization promoted trade unionism among the city’s growing Jewish community, and offered a home for garment-industry organizations like the Internatonal Ladies Garment Workers Union. As longtime union activist and politician J.B. Salsberg observed, “no single institution and no single building on Spadina—the main street of Jewish Toronto—was more important in the refashioning of the Jewish immigrant into an actively involved Canadian Jew than was the Labor Lyceum.” Beyond union meetings, the building met the community’s cultural and social needs by providing a venue for concerts, a beer parlour, dances, lectures, and hanging out. Obituary for Emma Goldman, the Telegram, May 14, 1940. Source: Canadian Jewish News, December 24, 1971. Source: Globe and Mail, August 2, 1975. Click on image for larger version. Despite being the largest Chinese restaurant in the city, Yen Pin Place was an expensive bust. 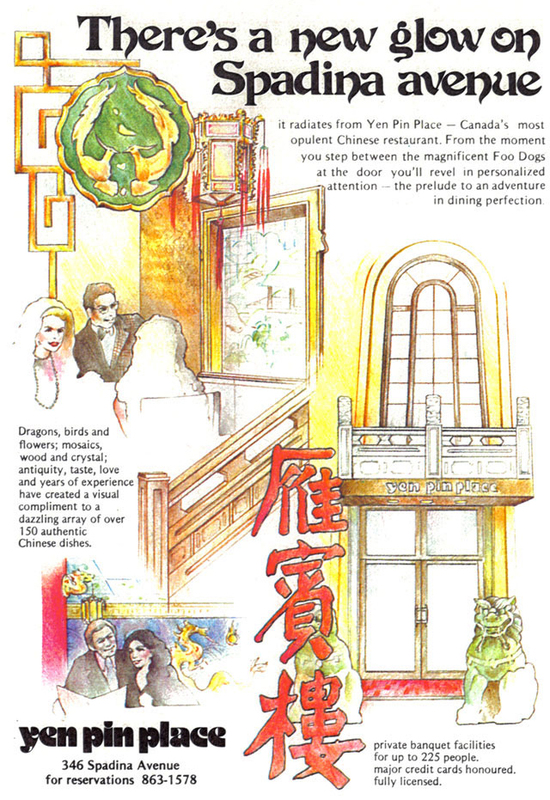 The luxurious décor was offset by bland food that the Globe and Mail’s Joanne Kates figured “would be perfect for a convention of 1,000 dentists from Des Moines.” After it closed in 1978, Yen Pin Place was succeeded by a string of eateries that Kates described as “each more outrageously pretentious and gastronomically mediocre than the last, and all of them doomed to failure.” The flops included Genghis Khan (a Mongolian BBQ), Paul’s Palace Deep Sea Shantung (once the city’s premier Szechuan restaurant, it had served better food elsewhere), and the President. Source: Toronto Star, January 24, 1986. Click on image for larger version. 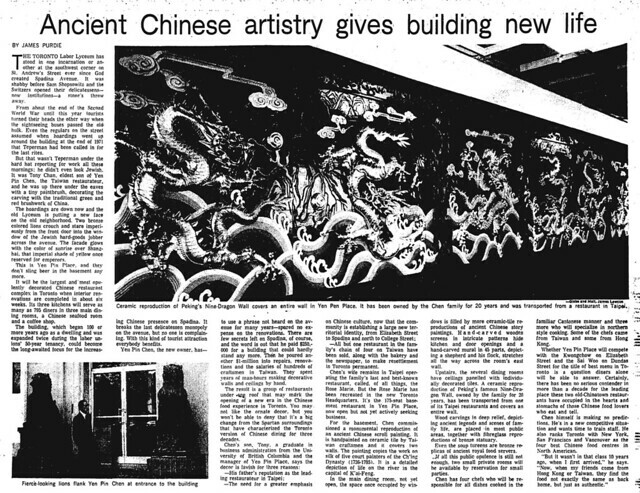 In 1985, the building was purchased by the Hong Kong-based Hsin Kuang restaurant chain, whose name still graces its facade. The Star enjoyed the warm towels that bookended every meal and the dim-sum offerings, but found the flavours of the rest of the menu lacked character. 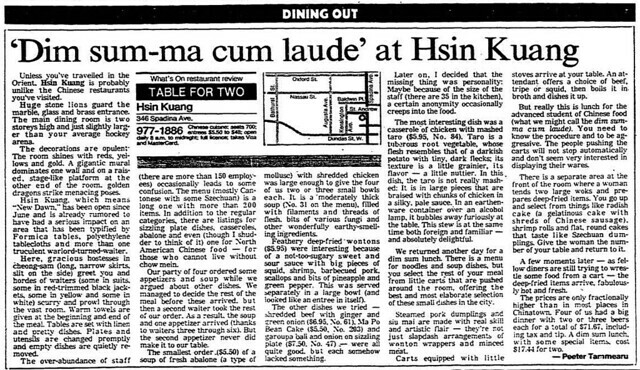 Hsin Kuang gave way to Bright Pearl in 1997, which carried on serving dim sum until a landlord dispute led to its closing in 2010. That Bright Pearl lasted for 13 years supports the superstitions and accounts of ghost sightings associated with 346 Spadina. The presence of the paranormal has been blamed on everything from an onsite mortuary to the billboards forming a “V” pointing at the entrance that channelled evil spirits. Ghosts are said to haunt the washrooms, even after an exorcist was sent in. Feng-shui masters have been consulted in design elements such as the placement of the “foo dog” lions to provide a healthier aura. Additional material from Spadina Avenue by Rosemary Donegan (Toronto: Douglas & McIntyre, 1985); the December 24, 1971 edition of the Canadian Jewish News; the August 2, 1975, November 15, 1976, and April 4, 1981 editions of the Globe and Mail; and the May 14, 1940, May 15, 1940, February 19, 1983, January 24, 1986, and August 31, 1995 editions of the Toronto Star. Originally published on Torontoist on October 23, 2007. Source: Toronto Life, December 1975. Mid-1970s diners expected a certain level of ostentation when eating at finer Chinese cuisine establishments. Decor was touted as much, if not more, than what went into one’s mouth. The atmosphere diners were promised at today’s featured restaurant hints at a feast for the senses. The history of 346 Spadina Avenue reflects the neighbourhood’s ethnic shifts. During the mid-20th century it was home to the Labour Lyceum, a centre for Jewish labour movement activity. After her death in May 1940, anarchist/activist Emma Goldman was placed in state in the building until the go-ahead was given by the United States government to bury her in Chicago. The lyceum later moved east to Cecil Street. The site has long been regarded as haunted, which may explain the presence of the foo dogs guarding the building. One set of restaurant owners called in an exorcist, who noted that the billboards across street pointed like an arrow, directing bad spirits into the building. Apparitions favoured the washrooms, catching patrons at the weakest moment of their meal. As of 2017, the main restaurant space sits vacant. In 2013, Heritage Toronto installed a plaque commemorating the Labor Lyceum.